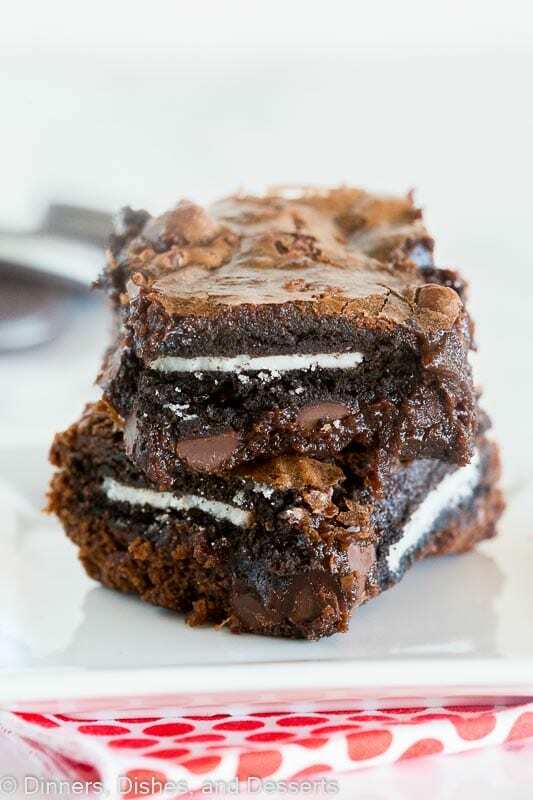 Oreo Brownies – fudge homemade brownies stuffed with Oreo cookies inside. 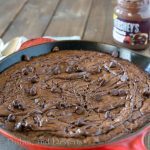 Fudgy, gooey, chocolate-y perfection! I think people either love or hate Oreos. People go on about how bad they are for you and how they don’t like them. But I don’t know how you couldn’t like them. They are so good, I can’t have an open bag of them in my house or I will eat them all! Oreo No Bake Cheesecake is one of my favorite ways to use them up! Making just about anything with an Oreo crust is automatically a good thing in my eyes. Oreo Cream Squares….oh my, so good! Really, when Oreo’s are involved you can’t go wrong. Then you throw in my beloved brownies and I am in heaven. 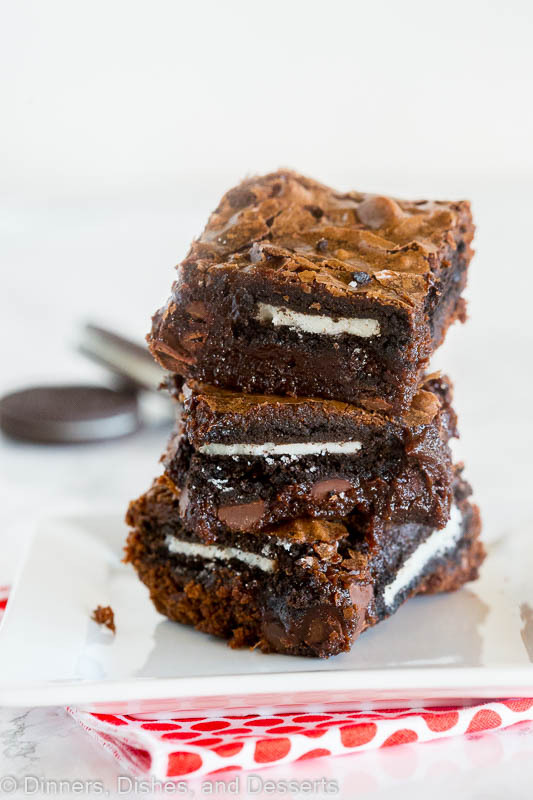 My favorite brownie recipe is the base for these oreo brownies. 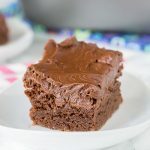 You can go ahead an use a box mix if you want, but nothing beats brownies from scratch in my opinion. 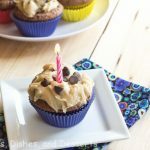 Plus there are only a few ingredients, so they are so easy to make! I am usually a double stuffed Oreo type of girl. I mean, if you are going to go there, why not go all the way. But for these Oreo cookie brownies, I went with the original version. I have tried it both ways, and the original just works better here. Don’t get me wrong, if you have the double stuffed, then by all means use them. But if you have to pick up a bag to make these, go for the original. These Oreo brownies would be great to make with all the different flavors and colors or Oreo’s. You could use the pastel ones for Easter. The mint ones would be a really tasty combination as well. They are always coming out with the flavors, so the ides never stop! 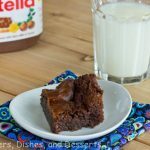 So the next time you have a brownie craving skip the box mix! 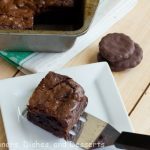 Make these homemade brownies, stuff in some Oreo’s and all of your chocolate cravings will be cured! Oreo Brownies - fudge homemade brownies stuffed with Oreo cookies inside. 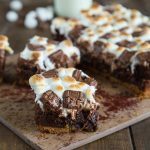 Fudgy, gooey, chocolate-y perfection! Preheat oven to 350 degrees. Line an 8x8 baking dish with foil. Spread 1/2 the batter into the bottom of the pan. Place Oreo's in 3 rows of 3 over the batter. Pour in the rest to cover the cookies. If using additional Oreo's sprinkle them across the top. Bake for about 25 -30 minutes, or until done. Cool before serving. 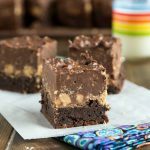 I’m a sucker for souped up brownies! Yum! you are killing me here. I love brownies and I love Oreos. This looks incredible! I’m all about putting Oreo’s into anything sweet. Great idea! Who are these people that don’t love Oreos?!? This sounds sooooo good. I’m going to a BBQ tomorrow and I think this would be a perfect and easy crowd pleaser. I even thing I have a bunch of Oreos that are probably getting stale that would work well I thing. Thanks for the idea! Adding Oreos, and especially peanut butter cups, to brownies is such a fantastic idea. Cannot go wrong with the double-stuffed! Haha, I read this “But add Oreo’s and I am done for, and all BELTS are off.” the first time! Haha, bets and belts will be off for sure with these brownies! These would be a bit sweet for me, I think, but I know the man of the house would go bonkers over them! I often put Oreos into my brownies but wish I had some leftover right now! I’m that weirdo who doesn’t like Oreo’s…but I actually don’t really like chocolate in general. Even crazier, right!? My brother would DROOOOL over these, oh my. 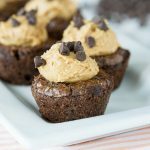 yum-these look delish!! I dont like oreos by itself, but put them in cookies, brownies, ice cream and I am in love. I’ve made this before except I put hot fudge in them…sooo good! Omg seriously?! This looks and sounds amaaaazing! How could you not like oreos?? Crazy people out there. I think I’d choose this over the original, how about you package some of these and ship them my way? 😉 love it! Oh interesting! I’ve never seen these, but it looks absolutely delicious! Oh, those look so good–my own not-so-fast metabolism is slowing further just looking at them. 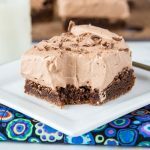 My family loves both brownies and double stuff Oreos…they’d love these! I’m affraid I’d eat the whole pan! These look so good! This is one of my faves! I’ve made them before using mint oreos (oh Heavens). Oreos are a great way of making brownies even better, hehe. Pretty cool and with Oreos being 100 years old…it’s perfect! …and I just love them! Mercy…these are a double shot of goodness! I would have trouble stopping at one…especially with Double Stuff! An oreo baked into a brownie…pure chocolatey heaven! I’m an Oreo hater, but make those peanut butter cups and we’re in business!! Amazing brownies! I only just found out a few days ago that Oreos are 100 years old hehe this is a great recipe 😀 i can’t wait to try this!!! Oh my, Erin! 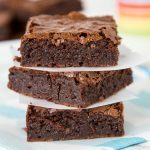 I’m a sucker for brownies too! These look so tasty! Wow! These look insane yummy! Congrats on being top 9! I am a sucker for Oreos. Once in college I manged to eat 1/2 the container all by myself in a matter of minutes. Definitely never try to do that again but they tasted great. I will make this with double stuf mint Oreos !! I can’t wait to surprise my kids with these! So decadent! Two of my favorites collide! These brownies look AMAZING!! These are dangerous! I want a whole batch immediately! Who are those crazy people who don’t like Oreos! I can’t imagine. I love the chocolate cookie part the best personally. Oh my goodness, if there were a plate of those in front of me there is NO WAY I’d be able to resist them! 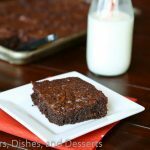 Super easy and delicious way to make brownies! 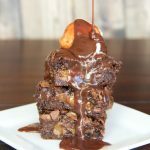 Love getting new ideas of brownies! Yumm stuffed brownies are the best!! 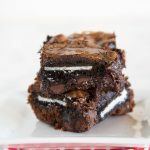 I love everything about these brownies, especially the Oreos! This is making me drool!! You can never go wrong with anything that has Oreo’s!